Damn, Herbs… You is fiiiiiiiiiiine! | I'm Gonna Cook That! Damn, Herbs… You is fiiiiiiiiiiine! There are French chefs rolling in their well buttered graves right now over that joke. I’M NOT SORRY! It’s poaching and braising week at school. We’re cooking a lot of chicken. So. Much. Chicken. Both nights of our practical? Chicken. We made a beef dish once, during roasting week, and it was beautiful. I’m looking forward to taking American Regional next quarter, because I’m pretty sure we’ll get to do things with other kinds of meat. Meat that is not chicken. But I digress. We’re gonna dance with what brung us, and this week, it’s chicken. 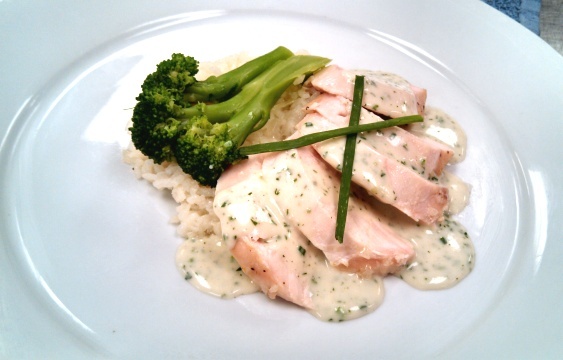 Chicken in Fine Herb Sauce, to be exact. It’s actually a really yummy dish, and not TOO much effort, really. You can serve it with rice and something green or orange or yellow and it will be a wonderful meal with all food groups represented and whatnot. Or something. I dunno. Mix the flour and 1 ounce of butter together to form a paste. This is called a beurre manié or “raw roux.” It will be used to thicken your sauce to a nappé consistency, which basically just means it is still pourable, but should be just thick enough to coat the back of a spoon. 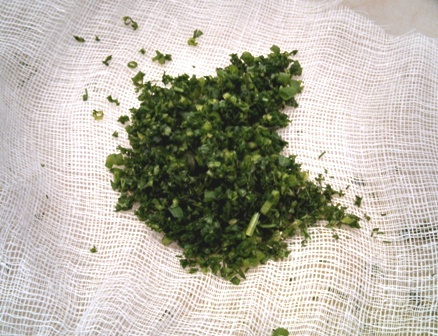 Mince all your herbs, and collect them in a large square of cheesecloth (or you can just use a mesh strainer, or a coffee filter). If you’re using cheesecloth, tie it up into a little bundle. Rinse the herbs under cold water, wringing the water out periodically until it runs mostly clear. Lay your rinsed herbs out on a paper plate or something flat to let them dry. Season the chicken breasts with the S & P.
Cover the bottom and sides of the saute pan with 1/2 oz of the butter. Sprinkle the minced shallots on top of the butter. Place the chicken on top of the shallots, then add enough wine and stock to come about halfway up the sides of the chicken. Place the pan on the stove over medium heat just until you see bubbles start to appear. Cover with your parchment lid (it’s called a cartouche. isn’t that fun? carrtoooooooooooosh! ), and pop the whole thing in the oven until the chicken is just cooked through. I used two large breasts instead of four smaller ones, and it took about 15 minutes. 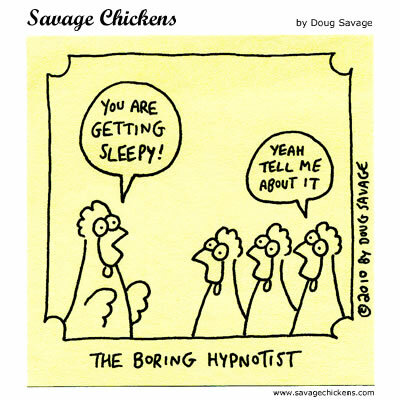 You probably also noticed that I poached the chicken with the skins on. That’s what our recipe said to do, but that’s just stupid. You can’t eat the skin after you poach it because it’s all rubbery and disgusting, so just buy the skinless ones to start or remove the skin before you poach. 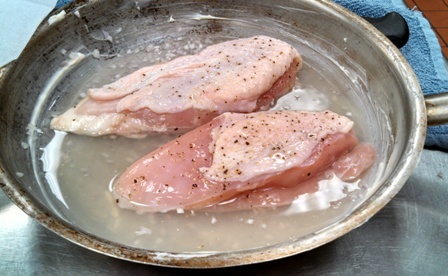 Once the chicken is poached through, remove it from the pan to your holding container. 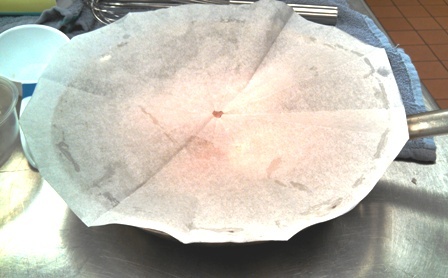 Cover it very loosely with foil to keep it warm. Don’t cover it so tightly that the steam can’t escape, because you’re not trying to steam away that beautiful poaching job you just did, right? Now it’s time to make the sauce, and the question becomes… to strain or not to strain? Again, if you were cooking for some food critic who was going to have a conniption over little pieces of shallot in their sauce, you’d strain it. If this is just for dinner at home, feel free to skip that step. If it was me and I was cooking for company, I’d probably go ahead and strain, but that would really depend on how much I was trying to impress them. Chances are good that I would find some way to completely invalidate any impression that I was Lady Smooth McSmoothington by tripping over air or having a large piece of parsley stuck in my teeth so it’s kind of a moot point, but A for effort, right? Anyhoots, for the sake of argument, strain the liquid into a bowl, then pour the strained liquid back into your saute pan. Reduce the liquid by about 25%, then add the cream and reduce again by about 25%. 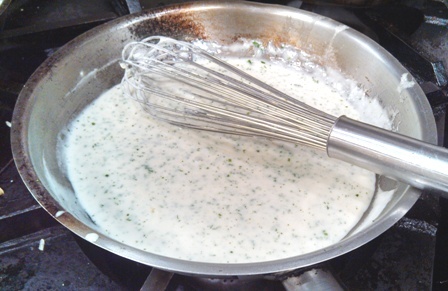 Over medium low heat, whisk the sauce while adding the beurre manié a little bit at a time until your sauce reaches the right consistency. You probably won’t use all of it. Conversely, if your sauce is getting a little too thick, you can just whisk in a little warm stock until it’s thinned out to the right consistency. MAGIC! Just before you’re ready to serve, stir/whisk in the herbs. Give the sauce a final taste and adjust the seasoning as needed. Plate up your chicken and whatever sides you’re serving with it, and drizzle about 1 oz of sauce over the chicken. It doesn’t take a ton of work to make a pretty plate with this recipe. ← This post really takes the cake.